In case you are new to this art blog Camera & Canvas, I am a visual artist who, until recently, created representational art i.e. realism oil paintings of figurative landscapes, commissioned portraiture, giant cat paintings, canoes, lakes& more. 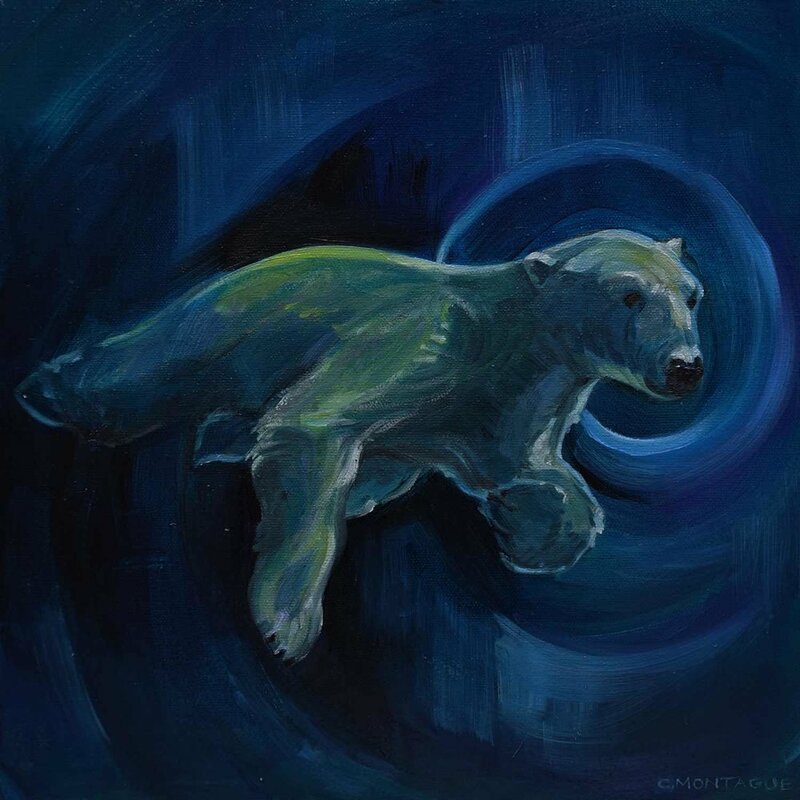 After the polar bears were put on the animals "of concern" list, I painted the polar bear painting With the Northern Lights in tribute. I continued to have polar bears on the brain when shortly after that I created CRAM, a Polar Bear World for The Sketchbook Project. 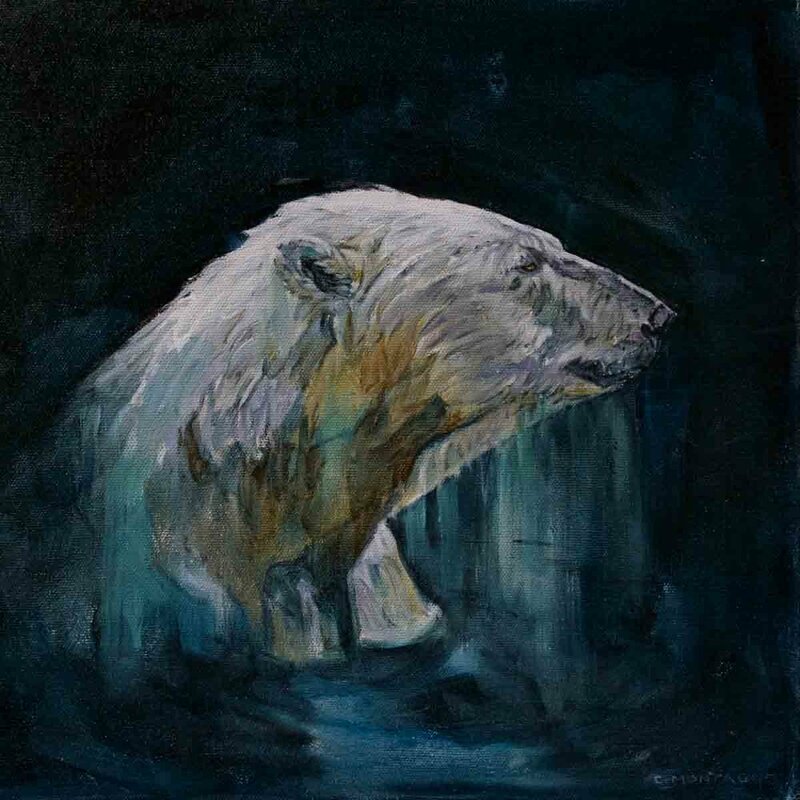 Increasingly, I found myself thinking about polar bear art, polar bear graphic novels,polar bear vacations...,you get the picture, all the while continuing with my portraiture practice & creating other representational art. Onward into a polar bear world of my own! 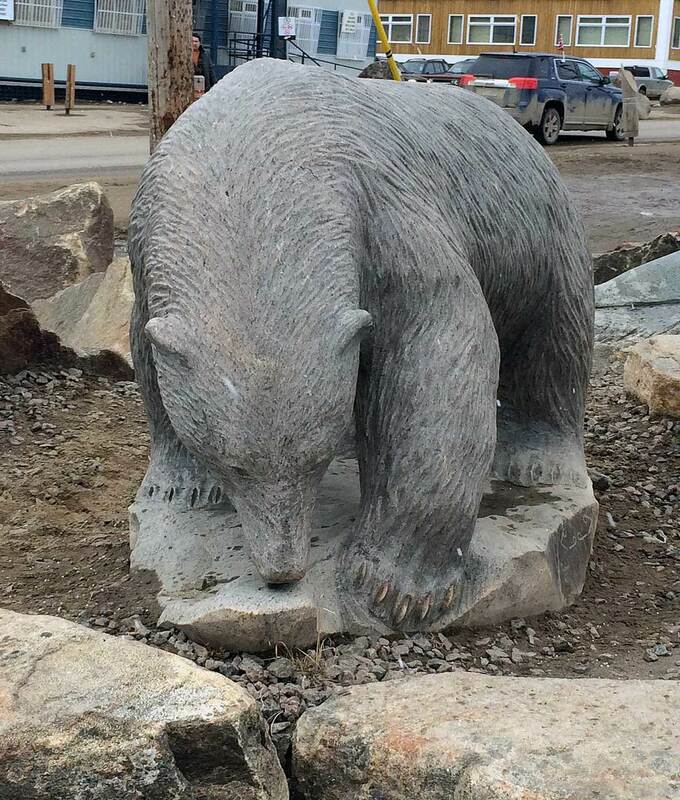 Polar bear art, polar bear blog, and yes, and trips to Cape Dorset, Nunavut, the Canadian arctic, to Churchill, Manitoba, Canada, polar bear capital of the world, followed (but not at the same time!). 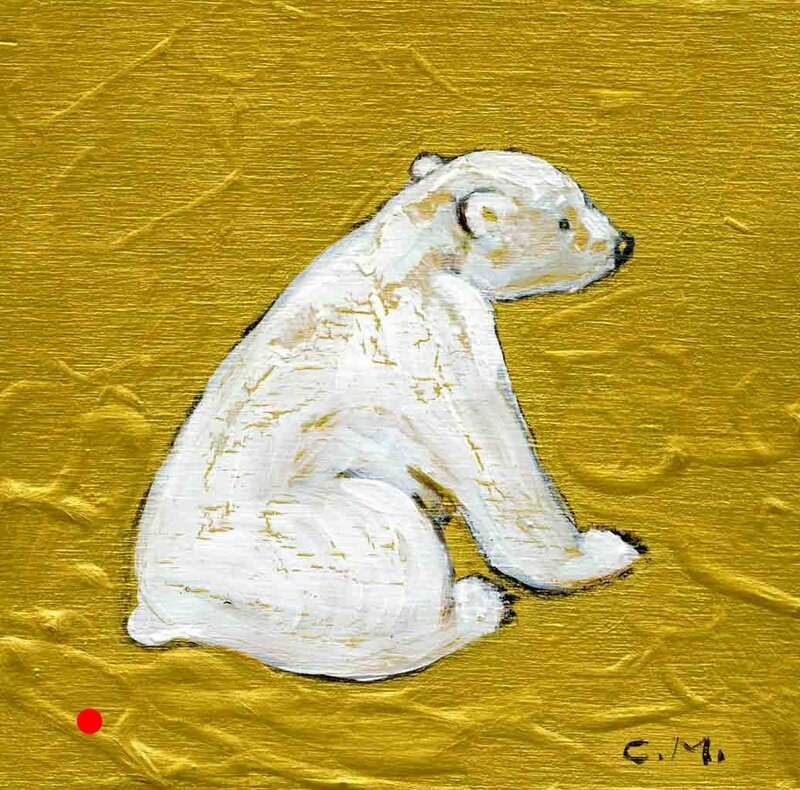 My website ChristineMontague.com is all about my POLAR BEAR ART. One thing is certain, in my part of the realm...Here there be polar bears. I hope that here there be you, too. 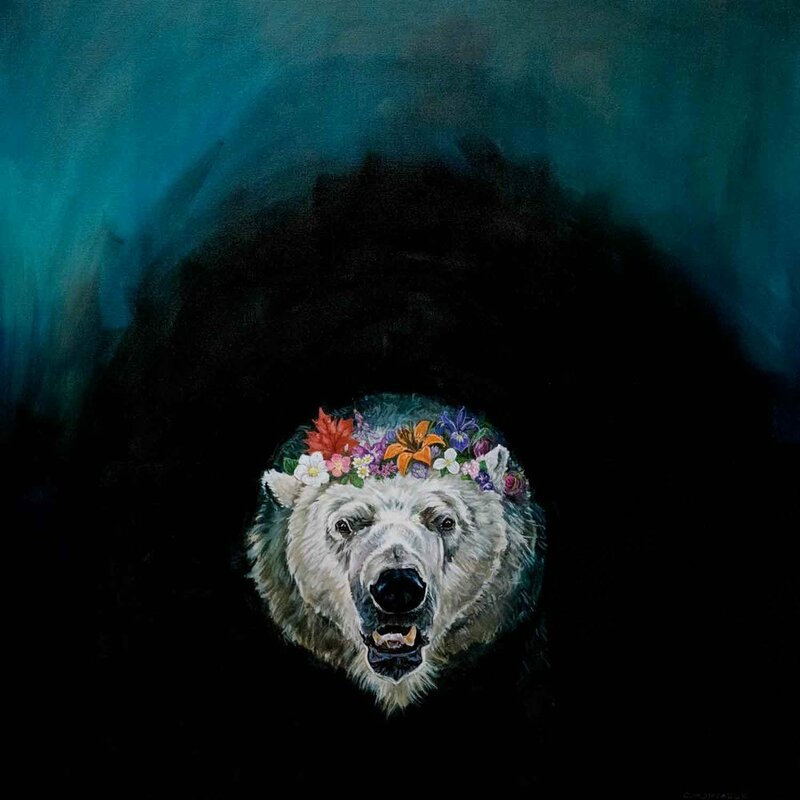 Anana isa 6" x 12" portrait oil painting on canvas of a beautiful polar bear. And that is what "Anana" means, beautiful in Inuktitut, the language of the Inuit in Nunavut, Canada's arctic. 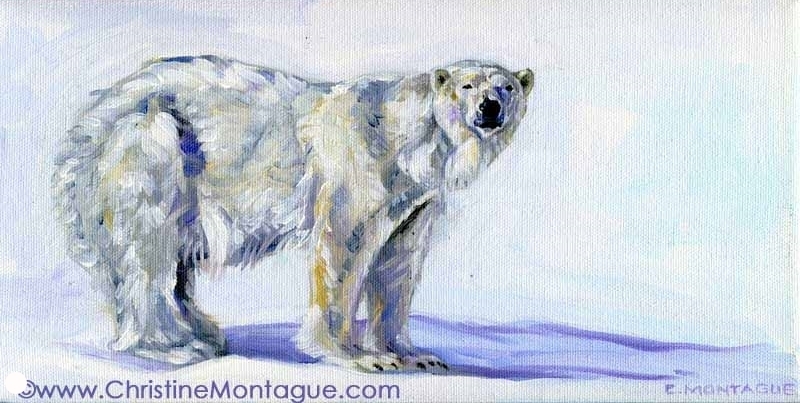 This painting is another of the polar bear oil paintings available in my series A Celebration of Polar Bears. This painting is not framed, but the painting carries around the edges and is ready for hanging. 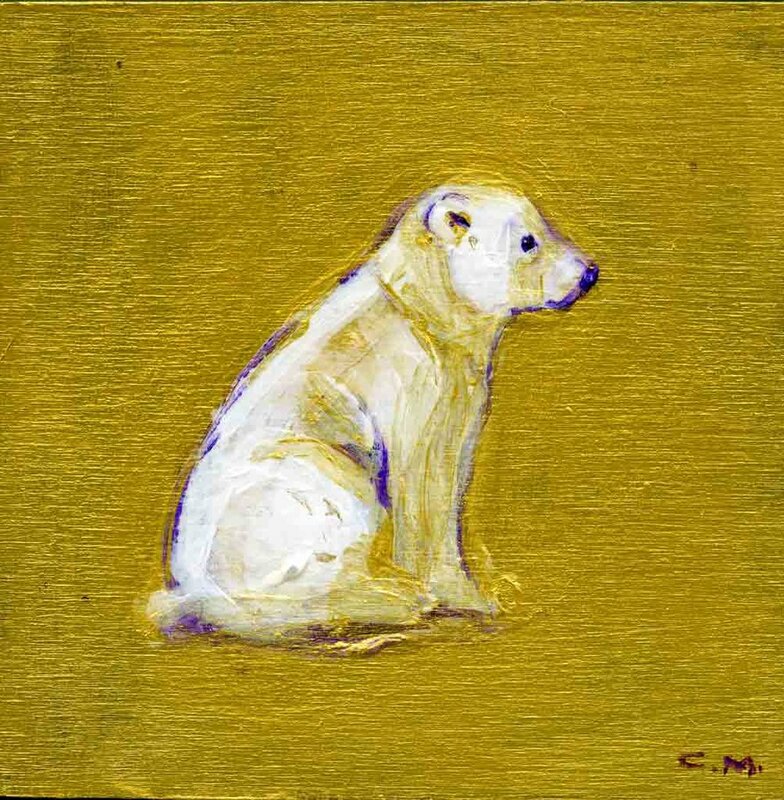 Silatuyok is the Inuit word for cute and intelligent, and so the perfect name for the lovely polar bear in the oil painting below. 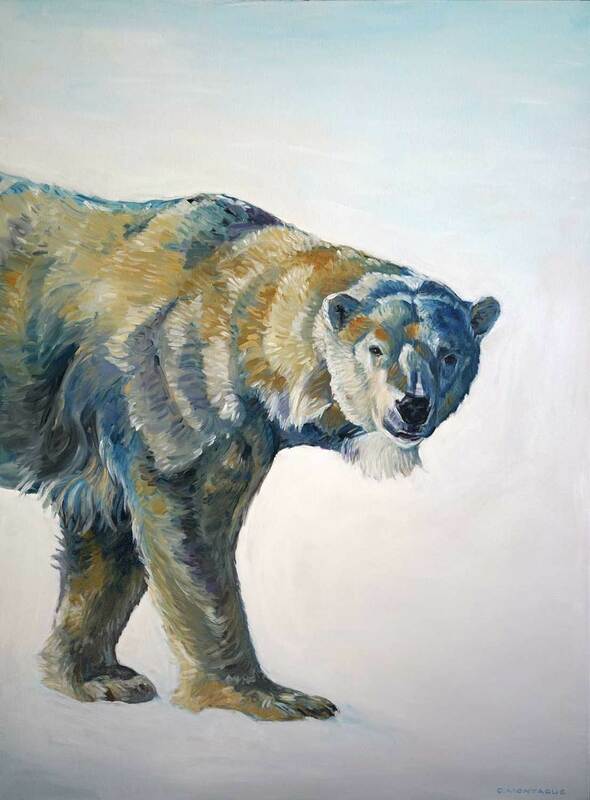 But as adorable as the big guy in this polar bear painting may seem, I have given a nod to his real nature - an intelligent, playful, but deadly predator - by making sure his giant nonretractable claws are clear. I actually love painting those big paws with the claws almost as much as those thickly insulated ears, and coal-black nose. Silatuyok. (6" x 12" oil painting) Polar bear oil painting ©Christine Montague. Canada. 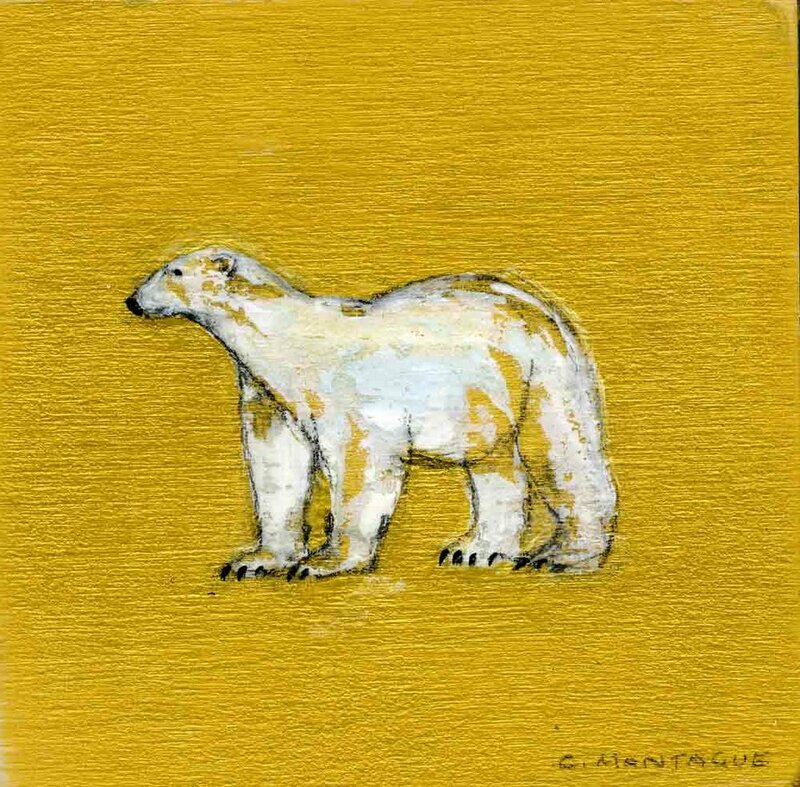 Silatuyok is just one of the recently created paintings available in my new A Celebration of Polar Bears Series. Although polar bears are solitary animals, when there is a group of them, it is known as a celebration of polar bears. Can you think of a better word to describe a gathering of these magnificent arctic animals?! 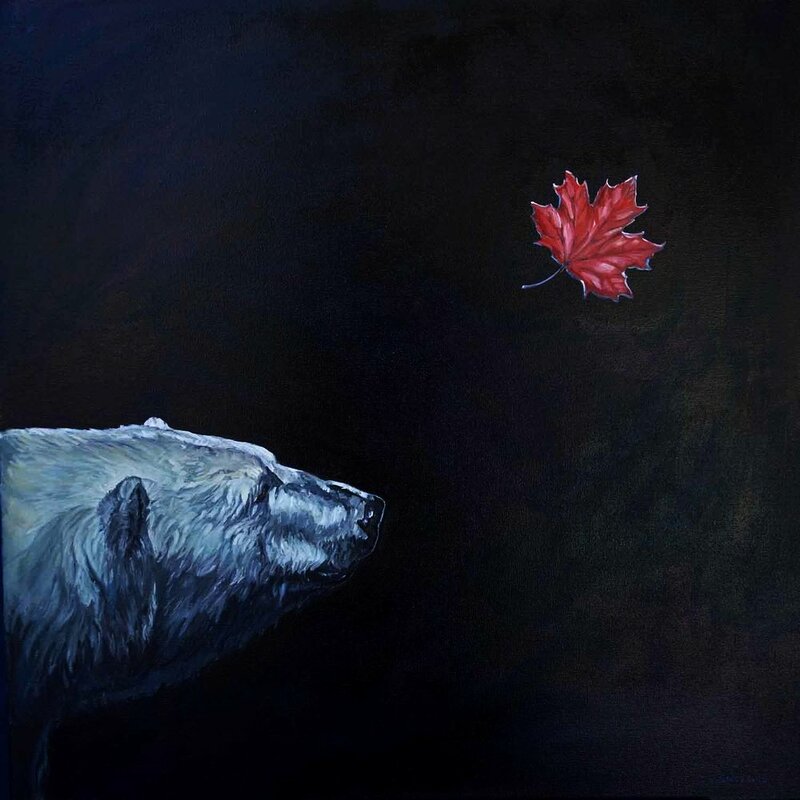 Each painting is a tribute to these intelligent, mighty arctic mammals. These portraits give a nod to their beauty, fuzziness, playfulness (goofy even? ), but one should never forget their awesome teeth and powerful claws are ever present. Can you see their distinct personalities, too? Please feel free to contact me through Guestbook atwww.christinemontague.com or visit there for more polar bear art. I hope, like this polar bear, you can look ahead with hope, and that your year will be full of good health, caring, and whatever success you wish. As you may know, LittlePortraitPaintings.com is my portrait business where I offer 6" x 6" portrait oil paintings (from a photograph) for a set price. It is a way for clients to buy original art, a one of a kind oil painting created personally for them, at a good value. I paint these smaller portraits with the same care and attention to spirit and detail I give to the larger , more traditional portraits I paint. Interestingly, almost all these portraits are ordered as a surprise gift. When the client wants two portraits done on the same canvas, the solution is simple - I paint on a 6" x 12" canvas. Above is a 6" high by 12" wide portrait oil painting of baby twin brothers, commissioned by a proud great grandparent. A loving first birthday present that these handsome little boys can treasure forever. Here is my latest little 6" x 6" portrait oil painting on canvas. Commissioned by this dear little guy's mom, it was a joy to paint this bright little baby boy face. This is an example of one of the wonders the internet holds for the artist and for the art collector. I have never met this mom or baby. In fact, they live hundreds of miles away. The mom stumbled upon my web site while surfing online late one night (all new moms can relate to this). She took a photo of her baby in his stroller with her cell phone and emailed it to me. We discussed the commission process by email, including that I leave out details of the stroller straps, etc. I received payment for the commission via snail mail, but, there are many payment alternatives available to buying online. I used Canada Express Post to deliver the carefully packaged portrait. This insured service supplied a tracking number that I shared via email with the client. By the time I got home from the post office , only a short distance away, the online tracking info informed me the parcel was in the system, about to be on its way, and posted the estimated date and time of arrival. In his latest book, The Icarus Deception, marketing guru Seth Godin shares his ideas on how art has evolved, who is an artist, and the importance of the “connection economy” to both. Here’s how two good friends, Matt Cook and Sorin Mihailovici, decided to have an adventure, but created much more. Their vision of travel became a story that surprised and connected us to their ideas. It fanned our trust so that we shared the story and supported its occurrence. Matt and Sorin did the dreaming, the planning and the travelling, but the connection economy was key to their success. Matt and Sorin are the Edmonton, Alberta, Canada guys who, in 2011, threw caution to the wind and a dart at the map to choose a destination for an adventure of a lifetime. 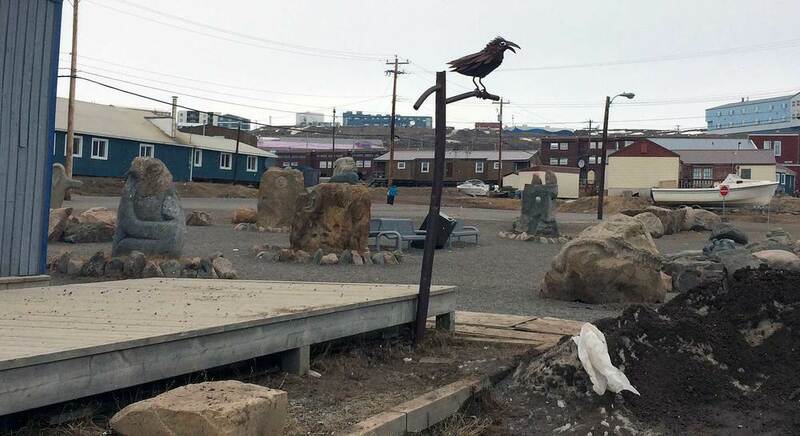 Dart thrown, they only had a month to sort out logistics and raise a heck of a lot of money for their trip to… (wait for it)…Svalbard, Norway. Svalbard. Closest town to the North Pole. 24 hours of darkness. 2000 people. 3000 polar bears. Now most of us, if we dared to throw the dart, would celebrate that it landed on Svalbard oops, slipsies count, Hawaii, and head straight on down to the closest convenience store to buy us a lottery ticket. But Sorin and Matt? Not these guys. They got their “grit”, as Seth calls it, going. 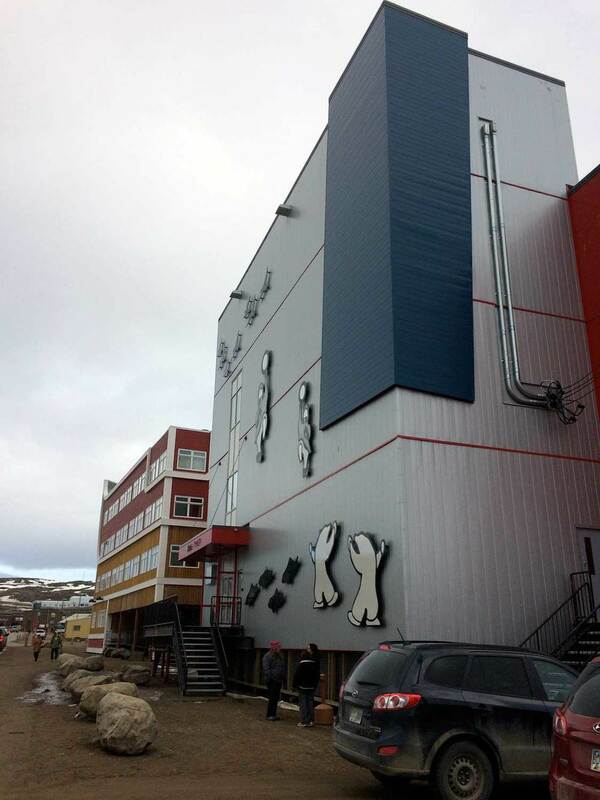 They made the decision to fundraise for the polar bear, as well as themselves. Polar Faith.com was on its way. Through their website, social and traditional media they shared the Polar Faith story. And the story delighted us. We trusted, and connected to them because their story was fun, and they sounded like fun, too. They could be the guys next door. The story was new, told with passion, humour and some urgency. They didn’t have a lot of time, these guys, to make it on their way. Let's help. We helped by further growing the connections. 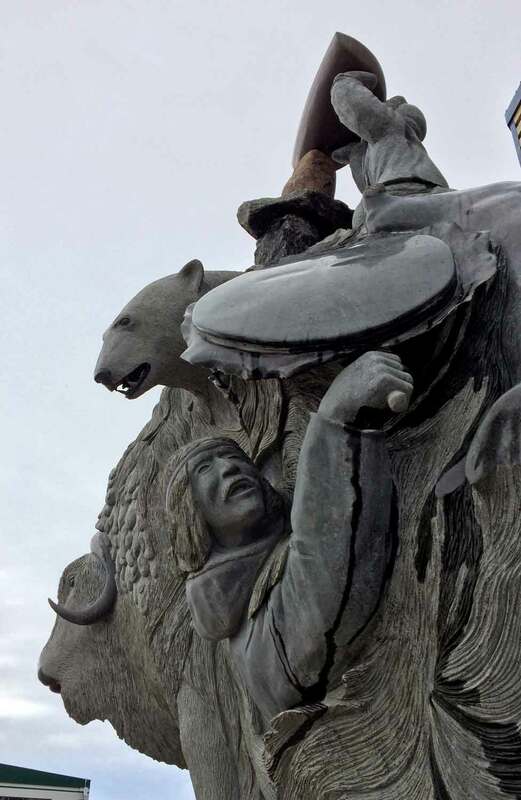 The story spread across Canada in the media and online. I think we wanted Polar Faith to work, and so I hope backing was as successful as it seems. It was certainly convenient and trustworthy (paypal). As well, Matt and Sorin, returned the favor. From hand warmers to personalized videos, thank-you items scaled to financial contribution. Matt and Sorin personally answered their emails. There was value in this. Everyone was giving and getting something for their part in the project. Connections and trust? Established. By the way, this is where my personal involvement came in. 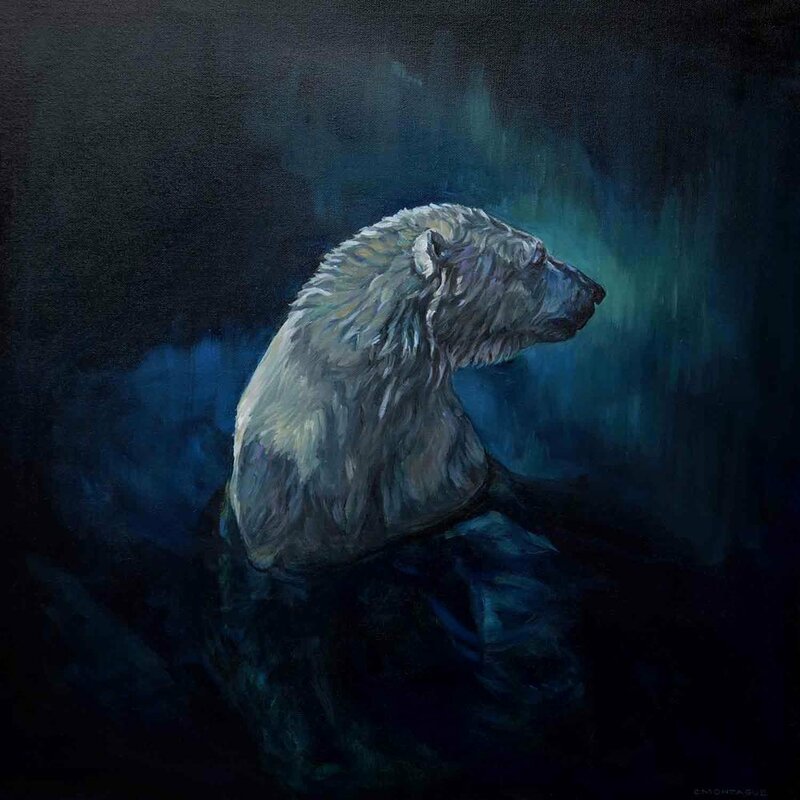 I had just competed my large oil painting “Polar Bear Swimming in the Northern Lights” here and I planned for more paintings in the series. 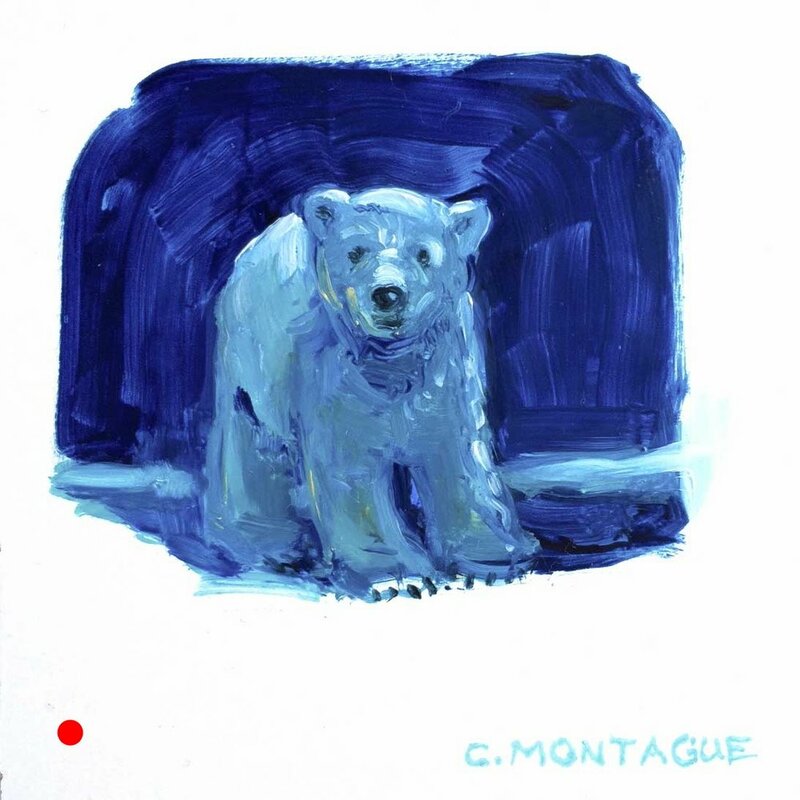 So why not give to a project that both captured my imagination and helped polar bears? Matt and Sorin documented their very excellent adventure. The short film "Polar Faith" premiered March 3rd, 2013 at the Global Visions Films Festival, Edmonton, Alberta. They have created a pilot for a television series “Travel by Dart”. The journey’s the art, along with entrepreneurship, customer service, invention, connection, technology, leadership, and all those other thing Seth talks about in the evolution of fine art. The internet and “connection economy” allowed Matt and Sorin to share their invention “Polar Faith”, and fund their project. Previously, the final product, the film, was the “art”, and the journey, the prep work. In this new model, the journey, and the connections made are the art, and the movie and the TV show, the very fine byproduct. And although most of us have learned by now, that penguins and polar bears do not co-exist, I did not know "arctic comes from the Greek word for bear, and Antarctic comes from the Greek meaning the opposite, without bear" (Polar bears International). How sad would it be, if re: the polar bear, "Antarctic " applied to the world? Perhaps , all the snow we have received today in the Toronto Area, will not seem as miserable, if regarded as a tribute to the mighty ursus maritimus. The little envelope containing my sketchbook from The Sketchbook Project, somehow was mislaid during my studio move, and completely out of mind with the excitement of family home for Christmas. My memory was suddenly jogged when The Sketchbook Project people wisely sent out a "deadline tomorrow" email yesterday. There was no way I was going to miss out on this terrific drawing project where artists from around the world have their sketchbooks (provided by the project) on display in the Brooklyn Art Library (U.S.A.), as well as online, and in a travelling art show. So, what to do?! With less than 24 hours to fill a sketchbook, I would do the student "thing" and CRAM which, by the way, became the sketchbook title, and maybe more than that , too.
" The Sketchbook project is a space for new work and experiment - it's not intended to be a portfolio" and " ...follow your book wherever it takes you and change your mind along the way". And that's exactly what I did, I veered off the course of the few sketches I had done before Christmas and my move out of my Williams Mill studio, and spent well into the night immersed into my polar bear fantasy world. You know how it is when you have a good book you can't put down? That's how I felt last night as I worked deep into the night with ease. Also I'd love to know what you think of my foray into fantasy illustration, and if you'd enjoy more posts on this.